› Author Affiliations Funding This study was funded in part by the Tekke Huizinga Foundation (The Netherlands). Background and Aim Patients with cirrhosis may acquire profound changes in haemostasis. Although haemostatic changes in cirrhosis have been extensively studied, most studies were performed in groups of patients with mixed aetiology. As thrombotic events appear more common in some aetiologies of disease, notably non-alcoholic steatohepatitis (NASH) and cholestatic disease, we hypothesized that haemostatic changes might be different across aetiologies. Patients and Methods We studied 109 patients with cirrhosis (31 cholestatic liver disease, 23 NASH, 37 alcoholic liver disease [ALD], 18 viral hepatitis) and 44 healthy controls. Patients with malignancy were excluded. Routine diagnostic tests of haemostasis, thrombin generation assays, fibrin permeability assays and a plasma-based fibrinolytic assay were performed. Results All patients had comparable severity of disease according to their Model for End-Stage Liver Disease score (9 [7–11]). Plasma levels of von Willebrand factor were substantially elevated across all aetiologies, with a disintegrin and metalloproteinase with a thrombospondin type 1 motif, member 13 levels comparable to controls. 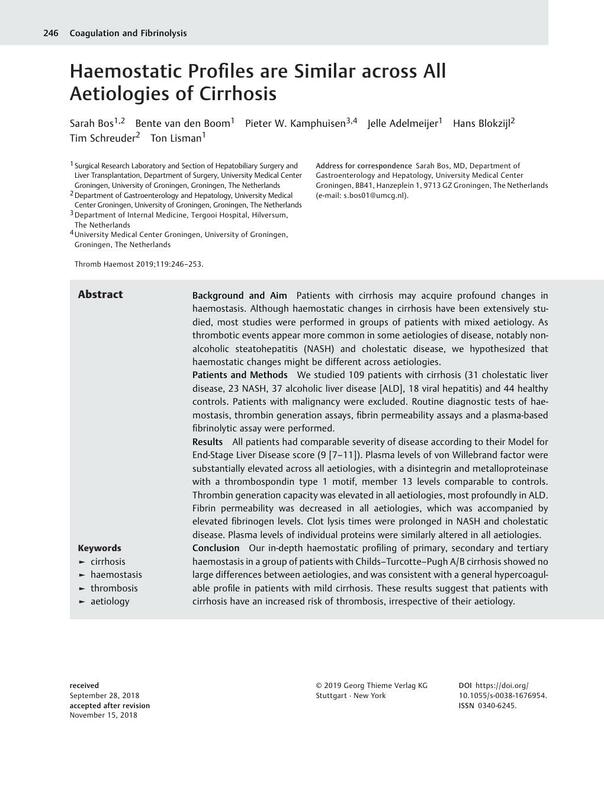 Thrombin generation capacity was elevated in all aetiologies, most profoundly in ALD. Fibrin permeability was decreased in all aetiologies, which was accompanied by elevated fibrinogen levels. Clot lysis times were prolonged in NASH and cholestatic disease. Plasma levels of individual proteins were similarly altered in all aetiologies. Conclusion Our in-depth haemostatic profiling of primary, secondary and tertiary haemostasis in a group of patients with Childs–Turcotte–Pugh A/B cirrhosis showed no large differences between aetiologies, and was consistent with a general hypercoagulable profile in patients with mild cirrhosis. These results suggest that patients with cirrhosis have an increased risk of thrombosis, irrespective of their aetiology.